Okay, I'll admit it. I committed a major transgression. No, it's not something that I need to keep a secret from Viv. In fact, she was right there with me. And get your mind outta the gutter! 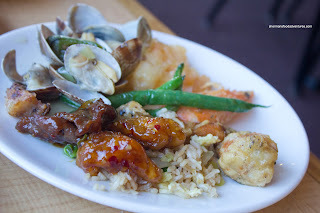 What we did could almost be inexcusable - we visited an Asian buffet (specifically Super Buffet) in Bellingham... Yes, something like this is on par with eating at places such as Foody Goody (now thankfully gone), Sui Sha Yah and Grand Buffet. Wait, I've done all three! OMFG. Okay, just throw the tomatoes at me. Hold on, don't do that, I think Super Buffet may need them because their salad bar was looking a bit sad... Oh trust me, that wasn't the only pathetic thing there. Oh where should I start... Wait, before I start, let me make one thing clear - drinks are NOT included. Why am I making this an issue? Because they asked us for our drink order without telling us it was an extra charge. It apparently happened to a few tables around us too. Not cool. 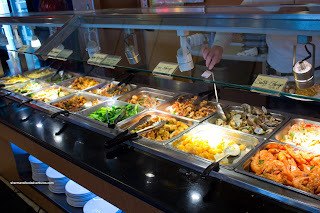 Much like Haiku and Bluefin in Seattle (and to a lesser degree Royal Star in Burlington), the buffet consists of several stations featuring specific Asian cuisine (I'm not even sure if I can use the word cuisine!). The Sushi section had various rolls, cones and nigiri which were not really all that appetizing to look at. The slices of fish atop the nigiri were smaller than a tip at a Chinese restaurant. 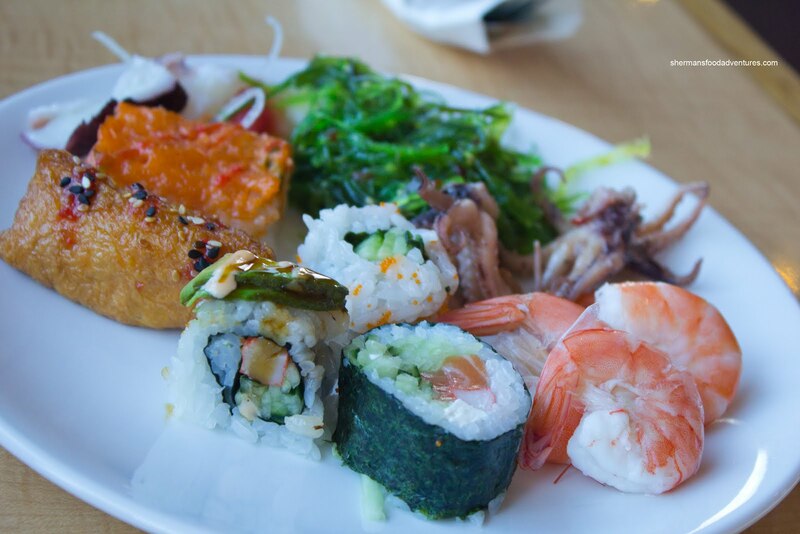 We could see more sushi rice than fish itself! At the very least, the rice was surprisingly acceptable having a texture that was still chewy yet not dry. It was bland, but hey, low expectations here. 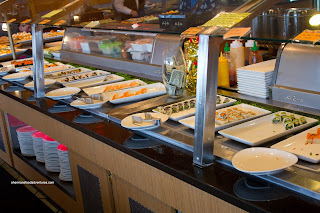 At the far end of the sushi bar was tempura and fried maki. Adjacent to the sushi bar was a section of Cold Items consisting of tako, hokkigai, wakame, oshinko, crayfish, peel 'n eat shrimp, mussels, squid, kimchi and for some odd reason, boiled eggs. Nothing here was really all that appetizing, yet it was edible. 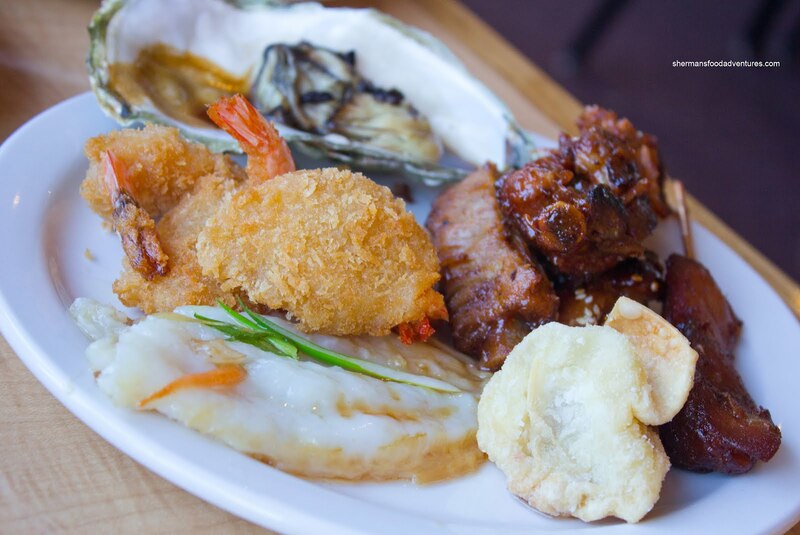 Across from this section was a mixed variety of Hot Food such as spring rolls, baked mussels, steamed oysters, snow crab legs, stuffed mushrooms, teriyaki chicken, pork ribs, fries, fried prawns, steamed sole, BBQ chicken, garlic bread and cream cheese & crab wontons. Most of the stuff here was pretty forgettable, especially the chicken since it was pretty dry. The pork ribs were alright. They were not fall-off-the-bone, but they were a "pleasant chewy". The crab legs were okay for what they were. Since these are typically frozen, there was not much to expect. Surprisingly, the sole was perfectly cooked being flaky and moist. At the end of this section was a selection of Soups which included wonton, egg drop and hot & sour. Meh, these were pretty typical buffet soups with the hot & sour being somewhat edible. Of course there was a lack of depth (because the soup base was probably water), yet there was plenty of flavour thanks to MSG. The ingredients were pretty decent though, especially the moist chicken. Behind the sushi bar lay a pathetic selection of salads. Sure, I'm not one to visit the greens too often, however, for some people, I'm sure it would be a huge disappointment. Rather than ingredients to go with the bowl of mesclun greens, there were far too many bowls of gelatin. Directly parallel to the "salad" bar lay the mostly Chinese Food section. 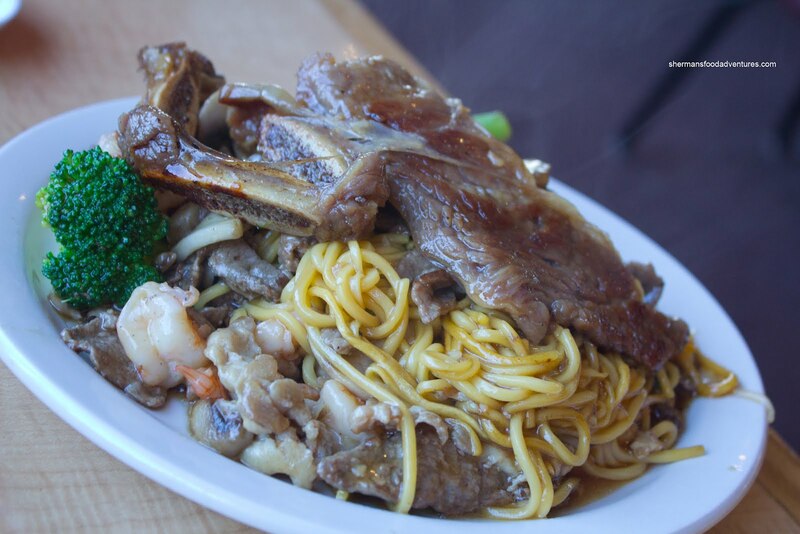 This included blue crab, fried prawns, coco shrimp, ginger frog legs, fried noodles, fried rice, General Tso's chicken, Mongolian beef, stir-fried green beans, steamed clams, fried squid, mustard greens, black pepper chicken, mixed veggies and ginger beef. The best way to describe most of the proteins would be the word "dry". The frog legs were overcooked and lacking flavour while the same could be said about the fried whole prawns. The coco shrimp were lost in too much batter. Yah, they seem to overcook their meat here. It is a buffet though, so I'll cut them some slack. Looking over my notes, I don't think I actually liked any of the food from this selection, other than the clams. The Mongolian Grill section was more like Japanese teppanyaki, yet whatever... I'm pretty sure for cost-effectiveness, investing in an authentic Mongolia n grill would've been a waste (since many people wouldn't care about the difference). 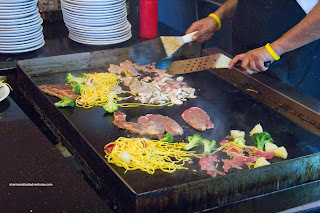 The items available were beef, chicken, shrimp, pork, various veggies, short ribs, steak, squid and shrimp skewers. 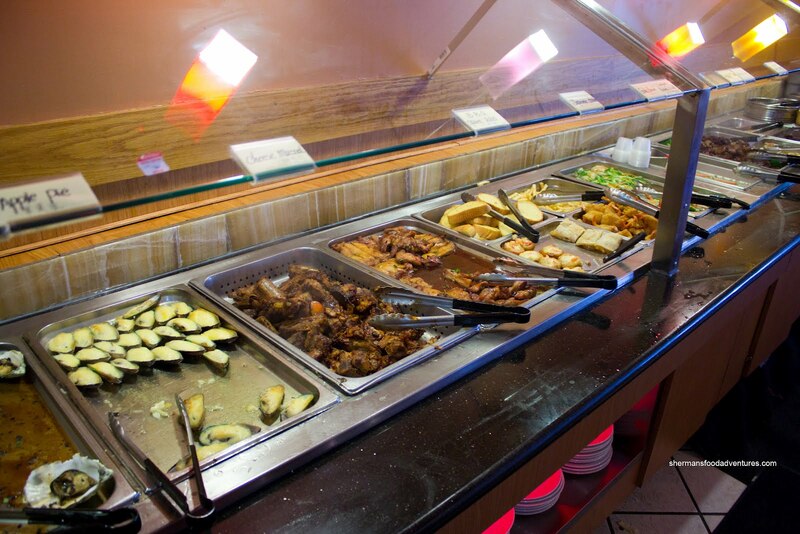 This turned out to be the least offensive portion of the buffet since the food was cooked up fresh (much like Royal Star buffet in Burlington). However, the chef dropped my short rib on the counter and proceeded to plate it anyways! And I left a tip too! Well, it turned out to be a moot point because the short rib was unchewable. The rest of the stuff was actually not bad with crunchy shrimp, fresh veggies and nicely cooked noodles. There was aggressive seasoning at work here (no, they don't let you choose your own sauces), yet it was not overbearing. Lastly, there was a whole section dedicated to Desserts. It only existed for the sake of existing. Many of the desserts were prepackaged stuff. In fact, the almond cookies were still in its tray from the box! For reference purposes, the desserts included cream puffs, macaroons (no, not macarons), palmiers, chocolate pudding, chocolate cake, fruit and banana with strawberry sauce (ew...). Alright. 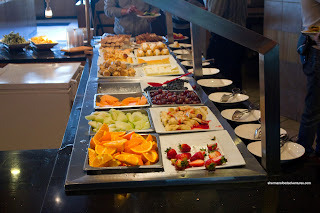 I have to admit that the price for the buffet ($13.95) is plenty attractive, considering the sheer amount of food. However, it means absolutely nothing when the food, at the best, is mediocre. The extra beverage charge was annoying and so was the service. Most of the staff were milling around chatting with each other. Actually, all the guys were flirting with the only young female on staff... I fully realize that a buffet is not the best place to find good food, but there are good buffets and bad buffets. Super Buffet falls into the latter. Both BG and I came here a few months ago. We had a coupon, so we saved 10%. The only thing that I liked was the Coco Shrimp. Mind you, I got it fresh. Please don't follow Etienne's suggestion, haha. Ew, yuck, no. 1)Sushi section had various rolls, cones and nigiri which were not really all that appetizing to look at. GO TO AN AUTHENTIC SUSHI PLACE. SUSHI GARDEN/HAPA IZAKAYA COME TO MIND. 2)Nothing here was really all that appetizing, yet it was edible. JOE FORTES/COAST O LOUNGE HAS A VERY GOOD SEAFOOD TOWER. 3)Most of the stuff here was pretty forgettable, especially the chicken since it was pretty dry. The pork ribs were alright. They were not fall-off-the-bone, but they were a "pleasant chewy". The crab legs were okay for what they were. FOR 16.99 WHAT DO YOU EXPECT? A $90 FINE DINING EXPERIENCE? GO TO An AUTHENTIC CHINESE RESTAURANT IN RICHMOND OR CAMBIE ST. NOT A BUFFET. YES THEY DO. YOU GOTTA SAY "WHAT ARE YOUR SAUCE OPTIONS" FYI - ITS TERRIYAKI/GARLIC/HOT SAUCE. You expected a FINE DINING experience from a $16.99 buffet. What kind of "FOODIE" are you? By the way, I go to this place every time I go to Bellingham. 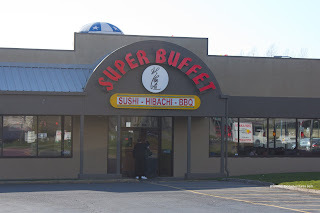 From Wonder Buffet / Old Country / Skagit Valley Casino, Super is by far the best. @Etienne, @mbsunshine and @LR Uh... LOL!